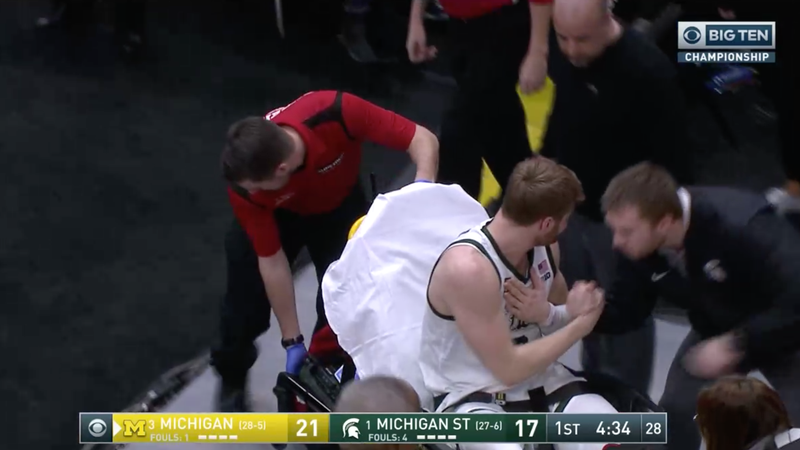 Late in the first half, Michigan State forward Kyle Ahrens jumped for a rebound and landed right on his ankle. The Spartan immediately fell to the floor in agonizing pain and play was stopped just seconds later. Ahrens’s ankle had to be put into an air cast as his teammates and coaches looked on with tears in their eyes. The arena unsurprisingly went silent at first, but erupted into cheers once Ahrens was taken away on the stretcher for further evaluation. (Warning: the injury is circled in the video and you can hear it happen). The good news is that it appears the injury was not actually as bad as it looked. MLive reporter Kyle Austin tweeted out that X-rays came back negative for any fractures. Update (6:44 p.m. ET): Ahrens’s season appears to be over.